Net Weight: Packet (60 seeds)1/2oz (800 seeds) (+$7)1oz (1600 seeds)(+$10)1/4lb (6400 seeds)(+$39)1/2lb (12800 seeds) (+$61)1lb (25600 seeds) (+$89) This item is currently out of stock! This vibrant Swiss Chard is attractive in all stages of growth. Most leaves are medium green, some are darker, with stems of yellow, gold, pink, crimson and various shades in between. Rainbow has a milder flavor than other chards and is suitable for fresh salad as well as cooker like spinach. Make cuttings of mature leaves about 1 inch above the ground and new leaves above the soil, plants will grow new stems and leaves. 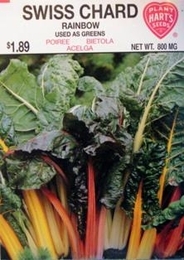 Bulk Swiss Chard seed available. 1600 Seeds/oz. Plant 1oz per 100ft row. 10 lbs of Swiss Chard seed needed per acre.